Most people know that Benedict Arnold was America's first, most notorious traitor. Few know that he was also one of its greatest Revolutionary War heroes. Steve Sheinkin is the acclaimed author of many nonfiction works, including The Notorious Benedict Arnold: A True Story of Adventure, Heroism & Treachery, Newbery Honor Book and National Book Award Finalist Bomb: The Race to Build--and Steal--the World's Most Dangerous Weapon, and National Book Award finalist Most Dangerous: Daniel Ellsberg and the Secret History of the Vietnam War. Steve Sheinkin is the award-winning author of fast-paced, cinematic nonfiction histories for young readers. The Port Chicago 50: Disaster, Mutiny, and the Fight for Civil Rights, was a National Book Award finalist and received the 2014 Boston Globe/Horn Book Award for Nonfiction. 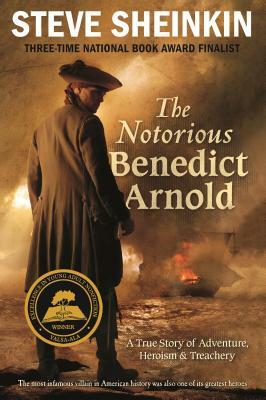 The Notorious Benedict Arnold: A True Story of Adventure, Heroism & Treachery, won both the Boston Globe/Horn Book Award and the YALSA award for Excellence in Nonfiction for Young Adults. Bomb: The Race to Build-and Steal-the World's Most Dangerous Weapon was a Newbery Honor Book, a National Book Award Finalist, and winner of the Sibert Award and YALSA Award for Excellence in Nonfiction for Young Adults. Most Dangerous: Daniel Ellsberg and the Secret History of the Vietnam War was a National Book Award finalist, a YALSA Excellence in Nonfiction Award winner, and a Boston Globe/Horn Book Nonfiction Award winner. Sheinkin lives in Saratoga Springs, New York, with his wife and two children.